Factory resetting your device isn't a bad idea, as it will restore your device back to the state it was when you newly bought it. The downside of factory resetting is that, all your data, media files and saved information on the device will be permanently be deleted. Why reset your iPhone or iPad? There are various reasons why you will need to factory reset your iPhone or iPad. Reasons may be because you want to sell off the phone or because it has become slow in performance, and more other reasons like that. Because a factory reset deletes all your files and information, it is recommended that you backup your iPhone or iPad data before wiping it. This article walks you through the whole process of backup and reset. The specific steps may differ a little bit from one version of iOS to another, so do not panic if one or two steps are missing on your device. Backup your device. Using its supplied cable, connect your iPhone or iPad to your computer. When it is recognised by iTunes, click on the left-hand pane to access the Summary screen. Click “Back Up Now” and follow through. Open your device’s Settings menu and follow this path: General -> Reset. Select Erase All Content and Settings. If you have a passcode on your device, you will be required to supply it at this point. After rebooting is complete, the phone will be in its factory state where you have to choose your language, set time and date and other on-screen instructions it may asked of you to set. After doing all that, you can now sell off the device without the fear of exposing your data and information to the new user, or you can aswell use the device in its clean new state. That's all. If you have any complaint, please drop it in the comment box below, and don't forget to Share this post with friends. Factory reset iPhone iPad. Factory reset iphone without password. 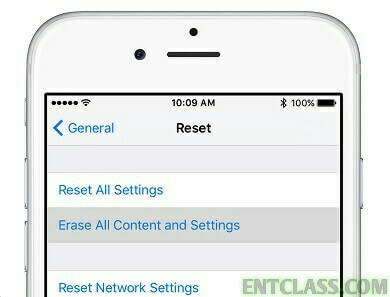 How to factory reset iphone without itunes.